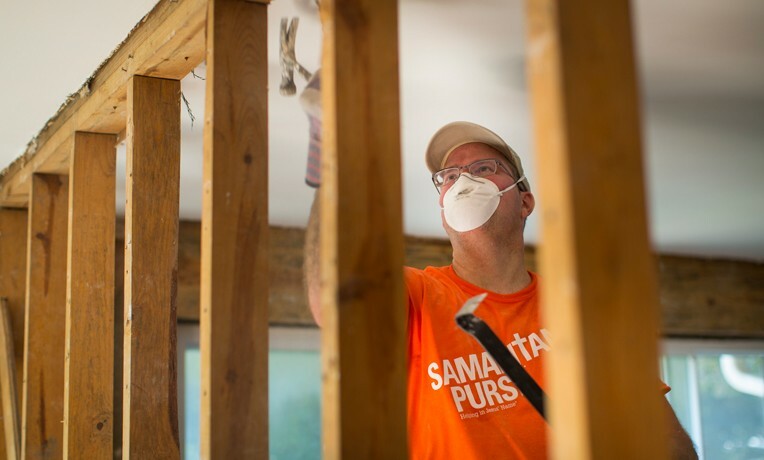 Relentless downpours continue to pummel the metropolitan Houston area, and Samaritan’s Purse is again deploying to the area to come alongside flood-weary residents in Jesus’ Name. Volunteers are desperately needed to assist the number of families who need help. Many of their homes were inundated during what local residents called the Tax Day Flood—which took place on April 18—only to be flooded once more this past week. More heavy rain is in the forecast. We will be focusing on the smaller communities north and northwest of Houston, including Conroe, Magnolia, Hockley, Spring, and Tomball. Our team in West Monroe, Louisiana—who completed a 12-week deployment over the Memorial Day weekend—transferred their Disaster Relief equipment to The Woodlands Church, which hosted our staff the first time we were in Houston. That deployment ended May 21. “There’s a very high concentration of housing five, 10, 15 minutes from the church,” Shoemaker said. “In one particular area, 5 feet of water rushed into about 200 homes. We will be removing mud and waterlogged belongings and then tearing out damaged drywall, insulation, and flooring. Mud outs are time consuming, and an army of volunteers is needed to tackle the mounting number of work orders. Billy Graham Rapid Response Team Chaplains are also on hand to provide spiritual and emotional care. One said, “I’m working on it,” while the other responded, “I think so.” Palmer took the time to explain how Jesus Christ came to die on a cross for our sins and that we can receive eternal forgiveness if we repent and trust Him for our salvation. Both prayed to receive Christ as their Savior. Shoemaker requests prayer for physical strength to perform the mud outs, spiritual sensitivity to minister to the needs of the homeowners, and open doors to proclaim the Good News.